(Phys.org)—A group of scientists at the University of Manchester in the U.K. has developed the first chemically powered autonomous molecular nanomotor—the motor mechanism is itself a transport medium that is capable of moving between fuel stops. In their paper published in the journal Nature, the team outlines the process involved in developing the motor, how well it works, applications to which it could be applied and their plans for changing it to be more efficient. Over the past several years, as the researchers note, various research groups have developed an assortment of extremely tiny molecular motors, which have been used for purposes such as propelling tiny walkers, pumping fluids or even synthesizing materials. But one thing they have all had in common is that they needed a constant source of food to produce power. In this new effort, the researchers have built a motor that can be fueled up and then sent on its way—it will run until it runs out of fuel, like an automobile. Thus, it represents the first autonomous nanomotor. To build such a motor the researchers looked to mimic the way nature builds motors, such as those that are involved in ion transport or more specifically, the way proteins are involved in accelerating the reaction in the hydrolysis of ATP. 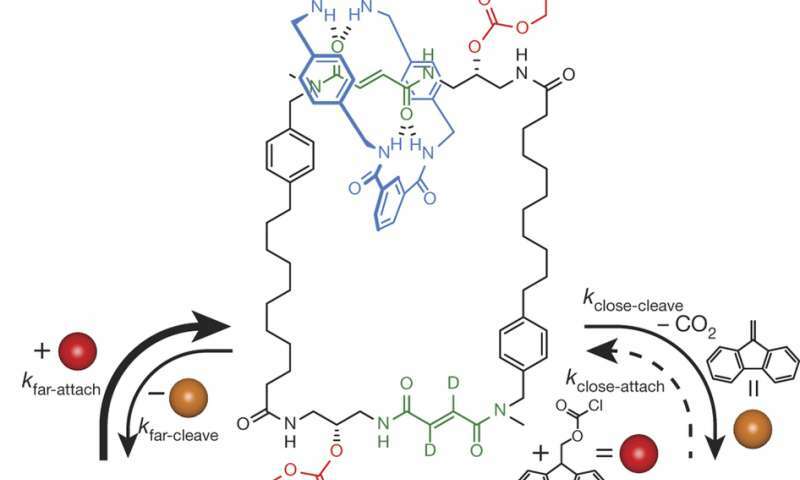 In their setup, their tiny motor is based on chemical synthesis—a device was created by assembling a hoop of benzylic amide macrocycle, a common component of a wide class of mechanically interlocked molecules—it was caused to move along a molecular track by reactions of Fmoc-Cl. In the setup, the ring position on the track established the speed rate of the mechanism due to additions of the pyridine group onto the device. It also prevented the device from moving backwards. The team readily acknowledges that their initial design is inefficient, quite slow and is not in a form that could be used for any real-world applications. But they do believe that after more work, their design will prove to be useful for applications as wide ranging as nanorobotics, artificial muscles, pumping systems or transporters. They even see it going back to its roots by possibly serving as a transport pack for carrying fuel for other engines. Molecular machines are among the most complex of all functional molecules and lie at the heart of nearly every biological process. A number of synthetic small-molecule machines have been developed, including molecular muscles, synthesizers, pumps, walkers, transporters and light-driven and electrically driven rotary motors. However, although biological molecular motors are powered by chemical gradients or the hydrolysis of adenosine triphosphate (ATP)1, so far there are no synthetic small-molecule motors that can operate autonomously using chemical energy (that is, the components move with net directionality as long as a chemical fuel is present). Here we describe a system in which a small molecular ring (macrocycle) is continuously transported directionally around a cyclic molecular track when powered by irreversible reactions of a chemical fuel, 9-fluorenylmethoxycarbonyl chloride. Key to the design is that the rate of reaction of this fuel with reactive sites on the cyclic track is faster when the macrocycle is far from the reactive site than when it is near to it. We find that a bulky pyridine-based catalyst promotes carbonate-forming reactions that ratchet the displacement of the macrocycle away from the reactive sites on the track. Under reaction conditions where both attachment and cleavage of the 9-fluorenylmethoxycarbonyl groups occur through different processes, and the cleavage reaction occurs at a rate independent of macrocycle location, net directional rotation of the molecular motor continues for as long as unreacted fuel remains. We anticipate that autonomous chemically fuelled molecular motors will find application as engines in molecular nanotechnology.